"Sometimes one dream is enough to light up the whole sky." October Sky would be one of the best examples of why uplifting and inspirational films make some of the best storylines for movies. Stories that give us hope and a sense that there are better things waiting for those who are determined and willing to do the work required to reach great achievement, help encourage us when we feel as if we aren't able to reach those goals in life that we set for ourselves. October Sky offers all of those elements in a very entertaining and inspirational way because of the fact that it is faithfully based on a true story. 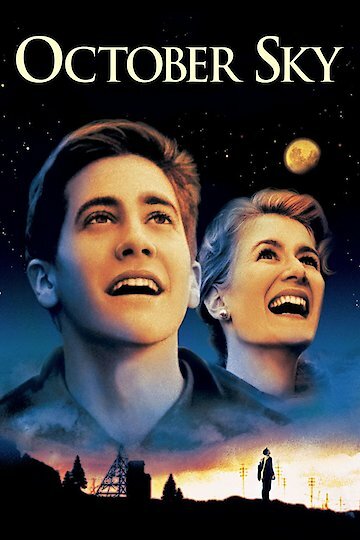 The plot to October Sky centers around a young man; Homer Hickam, who is played brilliantly by Jake Gyllenhall. Homer is from the small coal mining town of Coalwood West Virginia and the prospects for his future seem to lead in only one direction; coal mining. While Homer’s father, played by Chris Cooper, hopes that Homer will follow in his footsteps as a mine supervisor, Homer wants a different future other than Coalwood. Homer’s conflict is that the prospects of such a town and in the 1950’s offers little with the exception of coal mining or being lucky enough to get a football scholarship to a college. Unfortunately Homer just isn’t football material and can’t accept the idea of being a coal minor; luckily Homer’s teacher, Miss Riley, wants to help every student that she can to be able to attain a better future and encourages Homer in this direction. Homer has a fascination with the newly developed space program which leads him to idolize the scientist; Wehrner Van Braun. It doesn't take long before Homer, along with three other fellow dreamers, decide that their way out of Coalwood is going to come from science and begin learning about and building rockets. Despite the criticisms of Homer’s father, the boy’s principal and the accident that forces Homer to quit school for a short time to support his family while his father recuperates the boys never give up. The end result is that the entire town gets behind the boys as they compete in the national science fair for college scholarships, which they win. The best part is that Homer and his father come to terms of acceptance and appreciation of each other and their goals and dreams. The film doesn't leave the viewer wondering what becomes of the people whose lives we have been drawn in to; we learn everyone’s fate. October Sky is currently available to watch and stream, download, buy on demand at Amazon Prime, HBO NOW, Amazon, Vudu, Google Play, FandangoNow, iTunes, YouTube VOD online.